President Donald Trump on Friday signed an executive order reestablishing the National Space Council, which he said would launch a “whole new chapter” for the U.S.
“We’re going to lead again. It’s been a long time, over 25 years, and we’re opening up and we’re going to lead again like we never led before,” he said at a ceremony attended by astronauts including Buzz Aldrin. The space council was last in existence during former President H.W. Bush’s term. Thanks to the vision of President Donald Trump, welcome to an era of American leadership in space. It will bring us all closer together. You know it’s the greatest privilege of my life to serve as vice president for a president who gets up every day to keep the promises he made to the American people. Today President Donald Trump will take one step to make sure America leads again in the final frontier. With the action he takes today President Trump will bring a renewed sense of purpose to America’s space policy that will benefit literally every facet of our…life. Pence said reestablishing the council will help the economy, help create new technologies, enhance security, and inspire children to pursue an education in science, technology, engineering and math, or STEM. “Under President Donald Trump, American leadership in space will strengthen the spirit,” he said. After signing the order, Trump gave Aldrin his pen. About 25 people stood on either side of the podium. The group included three astronauts: Buzz Aldrin, David Wolf, and Benjamin Alvin Drew; Commerce Secretary Wilbur Ross, and three members of Congress. Also spotted in the room: Omarose Manigault. 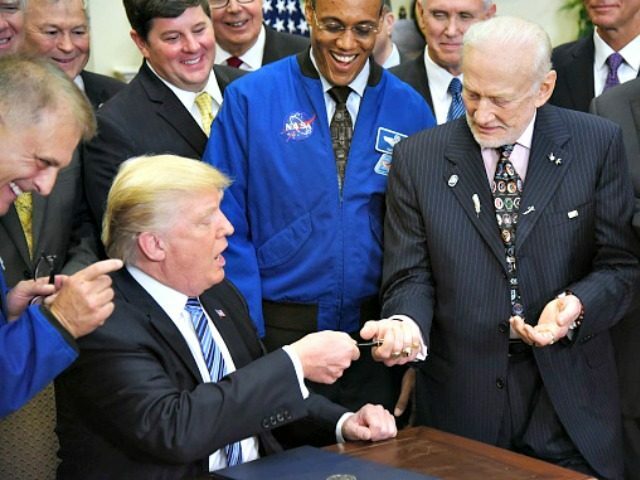 After the signing, Trump looked around and asked the room who he should give the pen he signed the order to — and when people responded “Buzz,” he handed Aldrin the pen.